AMONG the new fly fishing items that Dr. Slick is bringing to market in 2009 are a $12 combination nail knot/nipper tool, a Wizard Split Shot Clamp for removing split shot, ergonomic twisted-loop clamps that allow “about 50% more pressure than using the thumb and forefinger alone as with a traditional hemostat,” and new Braid Scissors, designed to cut SpiderWire, Spectra and other types of modern braided lines. Fishpond has added new color options, as well as a smart-looking new fabric, to their High Country Tech Pack, Shooting Star Chest/Backpack, and Windwalker Chestpack. But their best new product of the year is theArroyo Chestpack, which can be worn as a chest, waist or sling bag and features a zip-down “fly bench,” multiple attachment points, a padded neck strap and lumbar support. At only $59, we liked that the Arroyo has so many configuration options in a sport where gear versatility can rescue a budget. Fishpond also has two new rod cases out for 2009: the Dakota Carry-On Rod & Reel Case (see ($159), which measures 31″ by 9″ by 5″ and is capable of holding up to four rods, along with room for reels and fly boxes, as a carry-on flight item; and the Overland Trail Rod Tube Case ($89-99), also designed as a carry-on and made with ballistic nylon and locking zipper closures and available in two lengths. Lastly we want to mention that Fishpond is doing their thing to help encourage resource protection by offering the Piopod Microtrash Container ($12.95), a handy clip-on trash storage receptacle that comes in orange, blue, red and gray. We were pleased to hear that Oakley — freshly back from watching Oakley-adorned athletes win more than their share of gold at the Beijing Olympics — is almost ready to release a darker amber lens for fly fishers. The new lenses will join their current amber lens sunglasses and provide a great new option for tropical-water fly fishing in 2009. We’ve been testing their stylish new polarized Straight Jacket model ($190) ever since the FFR show and been very pleased by the results. C&F Design has several new fly tying tools available for 2009, including a Spare Bobbin Threader ($10.95), Rotary Hackle Pliers ($49.95), Dubbing Twister Plus ($29.95), Rotary Twister Plus ($54.95), 3-in-1 Half Hitcher ($34.95), Bobbin Rings ($9.95), Medium 2-in-1 Hair Stacker ($59.95), and a Rotary Fly Wheel ($64.95). 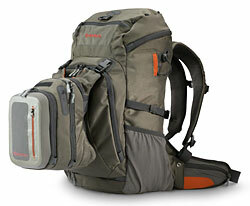 Simms has an all-new collection of backpacks, daypacks and chestpacks in their 2009 lineup. It includes the new Headwaters Backpack Combo set-up (shown at left) and waist packs and sling packs. Clear Creek introduces two new saltwater storage options as part of their new Black Fly series for 2009. The Back Country Bag ($79.00) is engineered to keep tackle dry and organized and features waterproof fabric and an EVA foam no-skid bottom. The “maya blue” bag measures 12″ x 9″ x 11″. 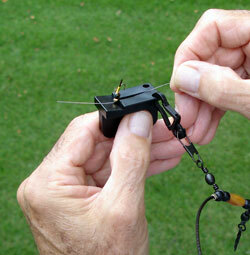 The new Tarpon Fly Stretcher ($89.00) holds up to 24 flies with leaders. It’s made from non-corrosive components and waterproof fabric. Tightline Enterprises, who won a Gray’s Sporting Journal “2007 Best” award for both their Magnetic Fly Guard and Magnetic Rod Guard, just came out with a clever little gadget designed to making threading leaders through small fly eyes a whole lot easier. The 20/20 Magnetic Tippet Threader grabs the hook eye and uses a small groove to hold it upright; the fly fisher then slides the tippet end down the groove and, voila, the tag end appears on the other side of the threaded eye. The only potential hang-up we saw was that the Tippet Threader had a hard time holding big-winged or bushy-hackled flies in the correct position, but the average size-20 nymph fisherman will think they’ve died and gone to heaven, especially in low light and cold conditions. 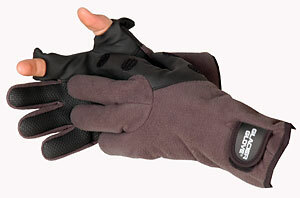 Glacier Glove‘s new patent-pending 710GY split-finger glove ($34.99) offers a hybrid mix of materials for added comfort and utility. The wind-proof and water-resistant fleece back is matched with a polyurethane thumb and index finger and 2mm neoprene palm. It’s a great addition to a line of what is already a highly functional line of gloves for anglers who want warmth and durability without sacrificing dexterity. 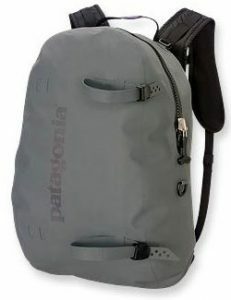 Patagonia has two cool new pack/bag products arriving in 2009: a redesigned Stormfront pack ($275) and the Sub Divider ($175), a smaller brother of their very popular Great Divider. The experience of picking up and playing with the ’09 Stormfront speaks volumes about Patagonia’s commitment to making this the most durable, most protective waterproof backpack on the market. (If you fully close the zipper, you can fill it up with air and it might work just fine as a emergency flotation device.) 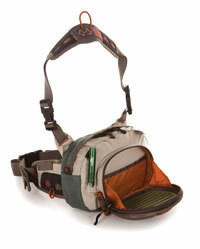 The new design features a removable harness system, letting the pack do double duty as a simple dry bag. And we’ve long been fans of the Great Divider, so we’re very glad to see a smaller version of this durable storage system coming to market. The Sub Divider is 11.5″ x 9.5″ x 8.5″ and shares some design improvements, like more rounded corners for easier zipping, with its big brother. Patagonia also offers the roomy Guidewater Duffle Max ($190) for 2009. Its 29″ x 14″ x 10″ space includes a floating divider to separate wet from dry. Finally, Patagonia let their green-ness run wild this year by finding a way to turn a rubber by-product from automobile gasket manufacturing into a soft wader mat that is extremely light and flexible. The Remat, as as Patagonia calls it, will sell for $35. Kaenon continues to pump out radical new sunglass frame designs to wrap around their highly sophisticated lenses. For 2009, the new Hard Kore’s ($209) fresh, half-rim style is feathery-light yet incredibly durable. The Hard Kore™ is offered in two lens shape options — normal for most face shapes and a larger lens for those who prefer additional coverage or require a bigger face fit. They also announced new LEWI sunglasses ($209), which in addition to great style provide maximum coverage from sun, wind, and debris. StreamWorks announced a new multifastener Tool Tether ($5), their new Lighted Ultimate Nipper ($10), and new Ultimate Forceps ($15) for 2009. The Lighted Ultimate Nipper has hardened stainless steel blades that cut monofilament, braid and gel spun, and its embedded hook file provides convenient hook sharpening, while its magnetic insert holds hooks and flies. 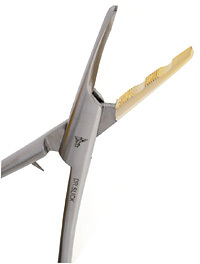 The 8.5″ Scissor Forceps grip larger hooks easily and feature micro-serrated edges for easy cutting of Dacron, spiderwire, heavy monofilament and all braided lines. The new Tool Tether is a coiled polyurethane attachment device that features rubber-padded clamping jaws and a 360-degree rotating swivel clip. William Joseph came out this year with a bunch of products that utilize big magnets in their closure systems. 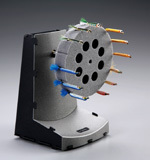 Their magnetic-closure packs were some of the more appealing products we saw at this week’s FFR show. 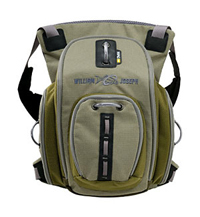 The MAG Series ($69-285) features one-hand-openable pockets, lids, and panels that use a very large natural magnet to create what the William Joseph folks claim is a “water-tight” seal. While everyone else is fumbling with zippers, you can be deftly retrieving fly boxes, leaders, and refreshment and then know that none of it will go tumbling back into the river because you forgot to close your pack completely. The Current chest pack ($89), pictured at right, was one of our favorite products tested at the Fly Fishing Retailer show. 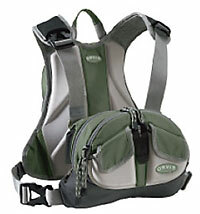 In luggage, Orvis has revamped a bunch of their designs and in February will offer the new super-comfortable Safe Passage Complete Chest Pack ($150) and Mesh Back Chest Pack ($99), as well as the Safe Passage Anglers’ Backpack ($229 with chest pack), designed for the hiking fly fisher. 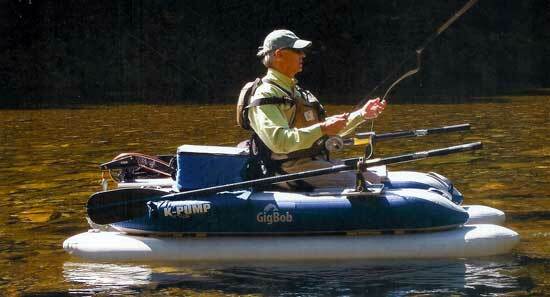 Lastly we want to mention one of the few innovations in watercraft that we saw at the Fly Fishing Retailer show. NRS‘s new frameless inflatable GigBob™ ($1,595, pictured below) weighs only 48 pounds and stuffs into a handy carry bag ($50) that you can sling over your shoulder. Despite it’s packable convenience, the inflated craft provides 15 square feet of flat area on its “decks” and provides the rigidity of a fully framed inflatable. The Gigbob also comes with a variety of available add-ons, including an anchor rope basket ($19.95), stripping apron ($24.95), economy 2-piece oar ($46.50-50) and Scotty Anchor Mount ($94.95). ($119.95-139.95). It’s part of their Discovery Line, which also includes the Sportsman’s Series ($99.95), featuring laser-cut game- and sportfish designs (we even saw a permit-engraved model at the show). Orvis will begin carrying the Westwater Products Thing-a-ma-Bobber strike indicator ($5.95) in their catalog in 2009. If you haven’t seen or tried the Thing-a-ma-Bobber and are tired of seeing your foam or yarn strike indicators lose their buoyancy, be sure to check these out. They come in three different sizes, but Tom Rosenbauer of Orvis suggests starting with the medium size (3/4″) since it fits the broadest range of situations. Orvis also has a new Magnetic Net Minder ($24.95), which consists of two powerful magnet discs that will help keep your landing net from swinging over your shoulder when you bend over.